There is no doubt that Suzuki is preparing a hot generation of the iconic Swift, as revealed by Autocar UK back in March, in what seemed to be the first pixelated images, providing a first idea on how the model will look before its arrival next year. Now, thanks to Ferd, a famous spy Facebook page, we have another teaser image which reveals the new looks of the model, which is rather the same one as the first tipped-off images, arriving back in March. The stylish seems to be rather the same, with the model now coming with an evolutionary design, with styling bits up front resembling the Jaguar F-Type. The fifth-generation looks much more mature, bigger and extremely imposing, and perhaps less appealing than the previous generation. We are looking here at a front end with a larger central grill, depicting a more aggressive attitude, adding new side intakes and sporty lip. The model has also gained new headlights which are now peeled back, while the A-pillars are now blacked-out. At the rear, the taillights provide a Vitara-like look, with sporty diffuser section also being lowered down. 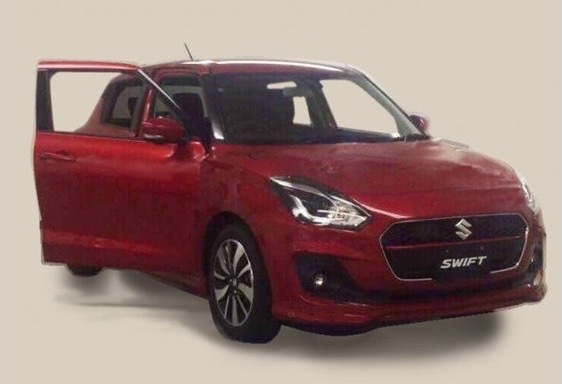 As for the engine lineup under the hood, besides the already present 1.6-liter naturally-aspirated engine with 100 kW, the all-new 2017 Suzuki Swift is also rumored to come with a new 1.2-liter flat-four pot, developing 66 kW, followed by a 1.0-liter Boosterjet three-cylinder turbocharged with 82 kW, and the same also found on the Baleno. The top of the line Sport would also feature a 1.4-liter with 103 kW turbo, the very same from the Vitara Turbo. More details are expected to arrive in early 2017, when the model will arrive on the market as the main competitor of the Ford Fiesta, Holden Barina or Volkswagen Polo.